Through speaking engagements and such, I’ve sold a lot of copies of Youtility, and we’re headed toward the best-seller lists. But I could use a hand from you to make sure it does even better. We’ve produced thousands of hours of free content here, and I don’t ask for much. But I REALLY need you this week, please. Until Friday, you can take advantage of a collection of exclusive book-related bonuses, not available anywhere else. Plus, free shipping anywhere in the USA. I’ll personally leave a voice mail for everyone to whom you give a copy of the book! This is a very important week (and book) for me. It’s the best work I’ve ever done, and I know you’re going to love Youtility. Can I count on you to grab a few today? 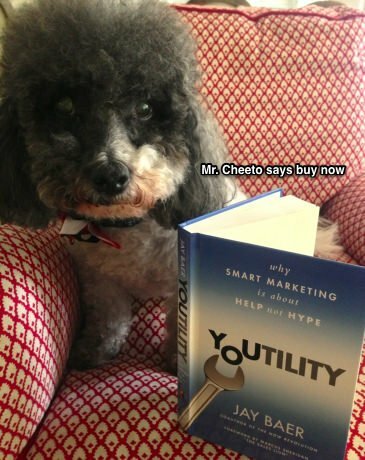 For extra cuteness and emotional appeal, up top is a photo of my dog, Mr. Cheeto, with the very first copy of the book. You don’t want to disappoint Mr. Cheeto, do you? Many, many, many thanks for your support. p.s. – The way I have the store and book fulfillment set up, I can only ship to US addresses. If you’re located elsewhere, just drop me an email at jay@boun.cr and we’ll figure it out together.